The holiday season has many traditions, which for some lovers of all things Irish include an annual reading of James Joyce’s short story “The Dead.” It’s set in Dublin, 1904, at a festive Yuletide party aglow with dancing, song and memories. If the Court Theatre were to mount its deeply touching adaptation every season forward, with its music brought to life in the authentic-sounding lyrics and melodies of Richard Nelson and Shaun Davey, I’d recommend it as a worthy habit for all adult devotees of the season, Irish or no. It’s unforgettable to witness Joyce’s pitch-perfect portrait of a 30th annual gathering of friends and family — when the spirits of past, present and future haunt the generations assembled. 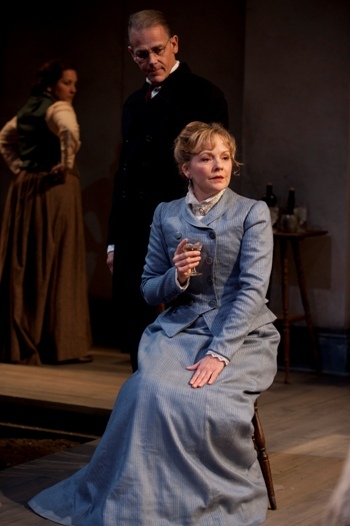 As Joyce tells it, it is the sound of a certain song that mesmerizes middle-aged Gretta Conroy, overwhelming her with unbidden passionate memories, which her unsuspecting husband, Gabriel, observes but does not understand. 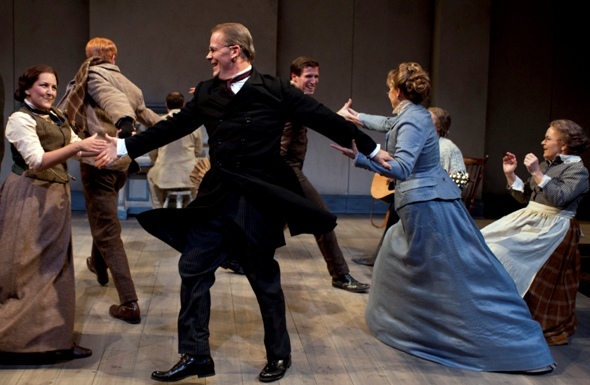 For the musical version of Joyce’s story, book-writer/lyricist Nelson creates a narrator role for Gabriel and gives even greater prominence to Gretta’s transfixing experience as the party swirls around her. (Philip Earl Johnson plays the congenial, buttoned-up husband and Susie McMonagle, radiant, is the wife stopped short by her former self.) The singer of the song that hypnotizes Gretta becomes a shy young man named Michael (John DeSelm), who takes her back a long, long way. Court Theatre first presented “James Joyce’s ‘The Dead'” in 2002, not so long after its winter Broadway run in early 2000. 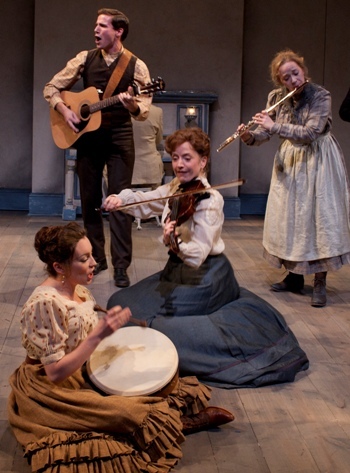 For the company’s 2012 revival, director Charles Newell and music director Doug Peck have re-thought much of it, integrating music even more deeply into the story by placing instruments in the hands of the actors. It works because, well, everybody sings and dances in Ireland. This particular party is set in the home of two elderly sisters who are both music teachers — Julia, a church soprano and choir director, and Kate, a piano teacher. Their niece, Mary Jane, is a music teacher, too, and when she takes up a fiddle to help a tentative young guitarist get over his paralyzing case of nerves, the precedent for all-out participation is set. Pretty soon flute, cello and bodhran (hand- drum) are taken up by the partiers who dance the night away. As such, “James Joyce’s ‘The Dead'” is chamber music, with individual story lines that emerge, recede and echo while the party ebbs and flows. We learn much that is unspoken — that Julia (Mary Ernster) is dying; that Mrs. Malins (Rebecca Finnegan) adores her drunkard son in spite of herself; that Freddie Malins (Rob Lindley), no matter how plastered, can charm a crowd; that sweet-hearted Mary Jane (Regina Leslie) is running her aunts’ household now; that Bartell d’Arcy (J. Michael Finley) is that embodiment of delightful tenor clichés, a narcissist — and that young love springs eternal in the servants’ quarters. 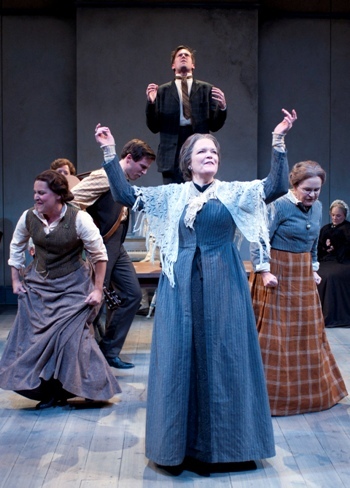 Carefully honed performances abound, to the smooth stage choreography of Newell. In the end, one is left with the recognition that Joyce got it right — at such ritual gatherings, when memory floods in, the past is vibrantly alive among us.